"All I wanted for Christmas was a sleigh ride. The ride we had with Bear Creek Adventures was wonderful- in many ways it exceeded my expectations. Our entire family had a great time from the 77 year old down to the 2 year old. I would recommend it, and as an extra bonus, bring a thermos of hot chocolate. It would make the whole outing perfect." Unfortunately, we will not be offering sleigh rides during the winter of 2015-2016. 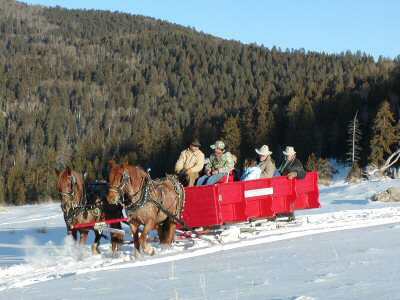 Please refer to our wagon/carriage rides which are available year `round. 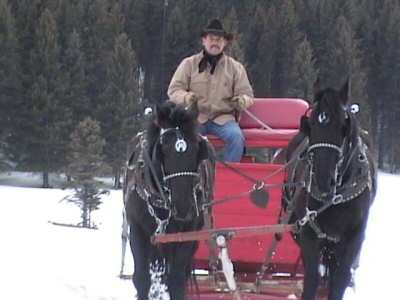 Click to watch a YouTube video of sleigh ride.